As hacks, data breaches, and other cyber-enabled crime become increasingly commonplace, this year’s National Cyber Security Awareness Month is an important reminder of the need to take steps to protect yourself and your family when using the Internet. 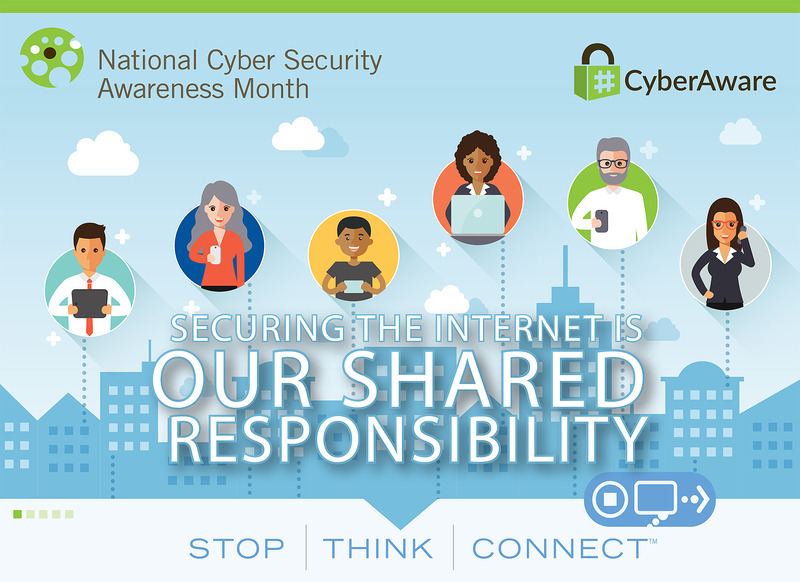 Launched in 2004 by the Department of Homeland Security and the National Cyber Security Alliance, the annual campaign held every October is designed to help the public stay safe online and to increase national resiliency in the event of a cyber incident. Learn about the IC3—and use it if you’re ever a victim. The Internet Crime Complaint Center (IC3) is a reliable and convenient reporting mechanism for the public to submit complaints about Internet crime and scams to the FBI. The IC3 uses the information from public complaints to refer cases to the appropriate law enforcement agencies and identify trends. The IC3 has received nearly 4 million complaints since it was created in 2000. Anyone who is a victim of an Internet enabled crime, such as an online scam, should file a complaint with IC3 to help the FBI stop hackers and other cyber criminals. Learn more about the lifecycle of a complaint submitted to the IC3. Practice good cyber hygiene at work. When you’re at work, you’re a target. From personal data to financial information to company secrets, company networks are a gold mine for hackers and fraudsters. One common scam that victimizes companies is business e-mail compromise, in which a hacker will gain access to a company official’s e-mail to defraud the company or access employees’ private information. Additionally, ransomware, in which hackers will place malware in digital files that demands a ransom, is a serious threat to companies and other large organizations. Learn more about cyber hygiene to protect yourself and your employer. Know the risks of the Internet of Things (IOT). Cyber security goes beyond your computer and phone. Many homes are now filled with Internet-connected devices, such as home security systems, baby monitors, smart appliances, and medical devices. All of these devices present opportunities for hackers to spy on you and get your personal information. Using strong passwords and purchasing IOT devices from companies with a good security track record are just a few of the things you can do to protect your family and home. Learn more about IOT devices. Cyber savvy? Uncle Sam wants you. As the cyber threat continues to grow, the FBI is similarly ramping up its efforts to recruit cyber experts to work as special agents, intelligence analysts, computer scientists, and more. The FBI partners with universities and other educational institutions with a science, technology, engineering, and math (STEM) focus to encourage students to pursue an FBI career, whether as an agent investigating hackers, an analyst looking strategically at threats, or a scientist evaluating evidence. The FBI offers a rewarding career in thwarting cyber attacks and bringing hackers and other criminals to justice. Visit FBIjobs.gov to apply. Learn how the FBI and partner agencies are protecting critical infrastructure. Terrorist groups and other adversaries view the U.S. critical infrastructure—ranging from the financial sector to hospitals to electricity grids—as high-value targets that would disrupt American life if attacked. The FBI plays a key role in thwarting these attacks by stopping plots against critical infrastructure and investigating cyber attacks. Protecting these targets is a team effort among federal, state, local, and private sector partners. Three of the key partnership organizations the FBI is a member of are InfraGard, the Domestic Security Alliance Council, and the National Cyber-Forensics and Training Alliance. These strategic relationships promote timely information sharing between the FBI and the private sector, which helps to keep critical infrastructure networks safe from hackers and terrorists. Several naturalized Americans from The Gambia planned an unsuccessful coup against the government of their homeland in 2014, violating the Neutrality Act, a little-known federal law. Christopher Wray was formally installed as the eighth Director of the FBI during a ceremony at the Bureau’s Headquarters in Washington, D.C.